Metal dome tweeters are notorious for being harsh or overly bright. That reputation was gained when they first appeared in the market decades ago. Today, that is no longer true. 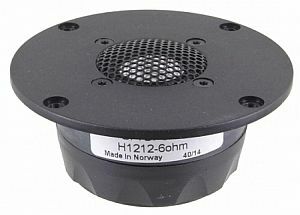 This Seas 27TBFC tweeter is a shining example of how refined a metal dome tweeter can be. I would say it’s one of the best tweeters in it’s price bracket. Sounds absolutely natural. No brightness, no grittiness. It just disappears into the music. The plot on the right is from Seas. At least, it looks quite realistic. (see 27TBFC-H1212 datasheet). I wouldn’t worry about the dome breakup at about 30kHz. It is well beyond human hearing abilities. What is important to me is how well damped the impedance peak is at resonance. Interestingly, the response is a bit similar to Seas. Though it’s not exactly the same, it does follow the same trajectory. Let’s not forget that Seas plot is with the tweeter mounted onto a 0.6m x 0.8m panel whereas this is taken with it mounted onto a speaker box with a 9.5″ baffle width. Nothing strange. Looks like Seas. Minimum impedance is 5 ohms which is not an issue because it’s below 100Hz. What is of relevance is above 2kHz, which are all above 5 ohms. Resonance is at 500Hz, peaking at 10 ohms. This confirms that this tweeter’s resonance at Fs is well damped. I do not expect any issues crossing near 2kHz without using a LCR network.